Dr. Andy Pernell is a second generation dentist, born and raised right down the road in Newton-Conover, NC. He attended the University of North Carolina at Chapel Hill graduating with a BS in Biology in 2008. He continued his education in Chapel Hill, earning his DDS degree from UNC School of Dentistry in 2013, graduating first in his class. While in dental school, Dr. Pernell earned multiple awards in esthetics and implants. In addition, he was inducted into the National Dental Honor Society – Omicron Kappa Upsilon as an Alumni Member. Upon graduation of dental school, Dr. Pernell completed an additional year of training in the Advanced Education in General Dentistry residency at the NC Veteran Affairs (VA) Medical Center in Fayetteville, NC. Since that time, he has practiced as an associate in the greater Charlotte area with some great mentors! Dr. Andy believes in providing an exceptional experience for his patients with quality care. 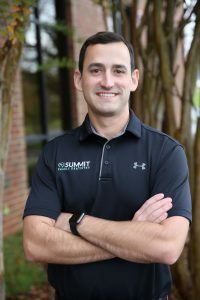 This is why he decided to start his own practice, Summit Family Dentistry. He is committed to providing the best care possible and takes over 100 hrs of CE a year, far exceeding state requirements. His next goal is earning his Fellowship in the Academy of General Dentistry. Outside of the dental office, Dr. Andy enjoys spending time with his family, going to the gym, playing various sports, and spending time with friends. Dr. Andy resides in the Lake Norman area with his wife, daughter, and dog.